Hello Bas. I thought someone would say that. No, it's from the front. You can't see from the photo but the pin numbers are embossed into the blue plastic so the green wire from the tip of the jack does go to pin 2. Hi Julian, I notice on YO3HJV'S diagram that pins 1&4 are connected together. That’s what it looks like to me. How about trying it with the D72? You might be right about the 2.5mm plug. Yaesu do seem to use non-standard connectors at times. Ken, I hadn't realized the D72 had a (non-USB) COM port. 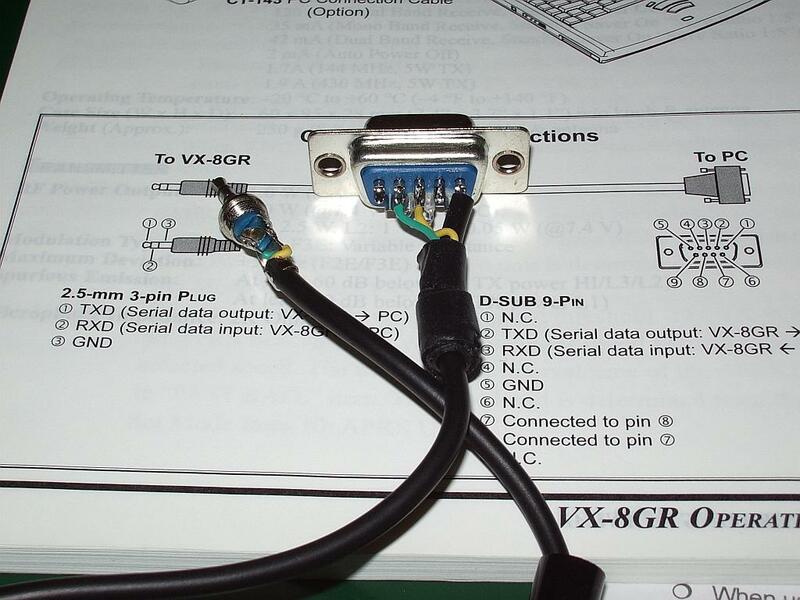 Having ascertained that it does, and that it uses an apparently compatible connector, I tried to get something out of it, but it doesn't seem to be possible to access the TNC through it. The only output option for the COM port appears to be Waypoint, but I couldn't get anything to appear there. However when cycling through the TNC options I discovered that "CR/LF GPS CR/LF" is output to the port (at 4800 baud regardless of the menu speed setting) which at least seems to show that my cable is OK.